RoyalEnfields.com: Was tiny writing a big plug for Royal Enfield quality? Was tiny writing a big plug for Royal Enfield quality? Gearbox filler plug on my Royal Enfield Bullet now specifies brands of oil. Royal Enfield enthusiast Chris Overton of Canada came to the rescue when I enthused about about an interesting gearbox oil filler plug I spotted on an old Albion four-speed for sale on eBay. 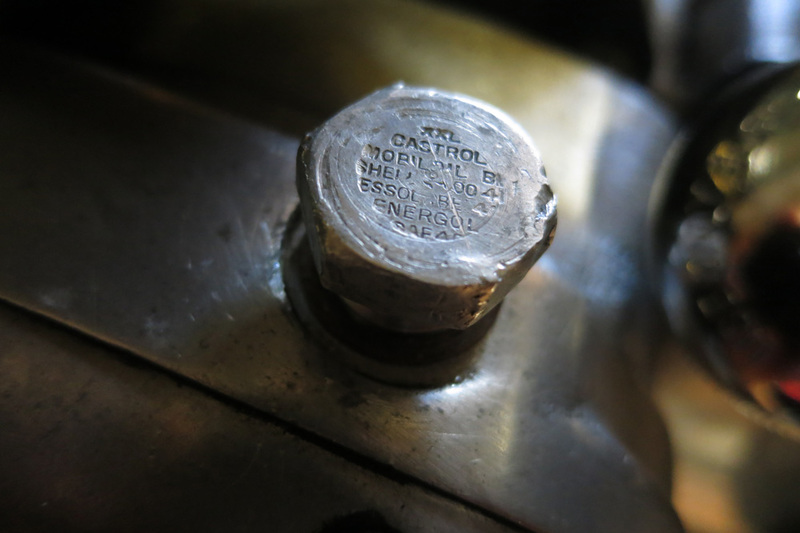 I was captivated by the tiny writing on the plug (it's really just a stubby bolt). 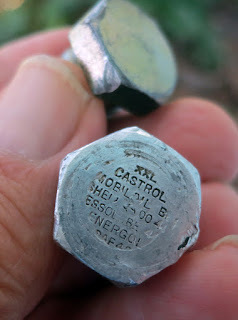 The stamped writing lists the oil recommendations for the gearbox: Castol, Mobiloil, Shell, Essolube and Energol. They're great old names that tie the Royal Enfield motorcycle to its ancestral home in England. In contrast, there's a plain plug in the gearbox of my 1999 built-in-India Bullet. Chris apparently has extras and offered to send me one. I begged him not to strip one from a gearbox he hopes to sell one day — to me, the writing on the filler plug is the best feature since the neutral finder. And I wasn't looking for a plug in concours condition. from my 1999 Royal Enfield Bullet. "The plug I selected came from the remains of gearbox AM247, probably fitted to a bike in the last quarter of 1958 for the 1959 model year. Probably fitted to an Indian Chief but might have been an Indian Apache. There were 800 Chiefs built and 83 Apaches, so this has a rare pedigree (albeit an identical part to the thousands fitted to other Enfields)." The battered little plug testifies to a long, busy life. 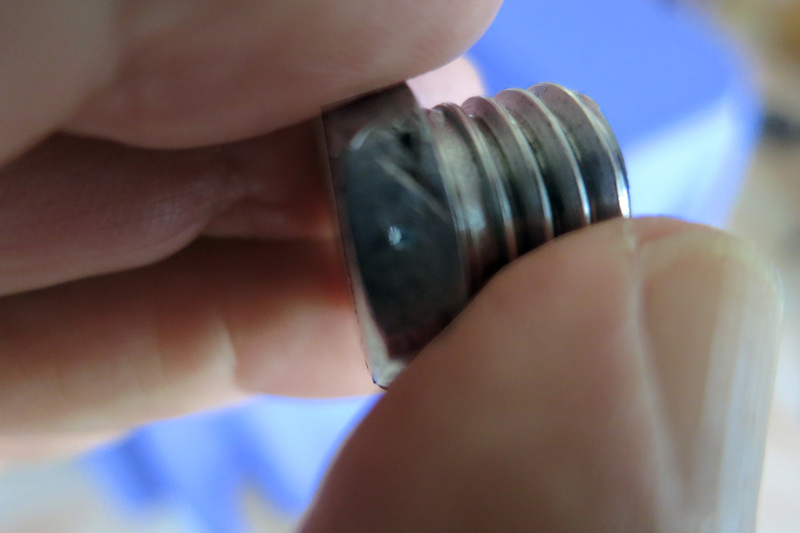 But there were more surprises: for one, it weighs much less than my existing steel plug. "This plug is alloy so, at 7 grams, it is serious 'go fast' stuff," Chris joked. 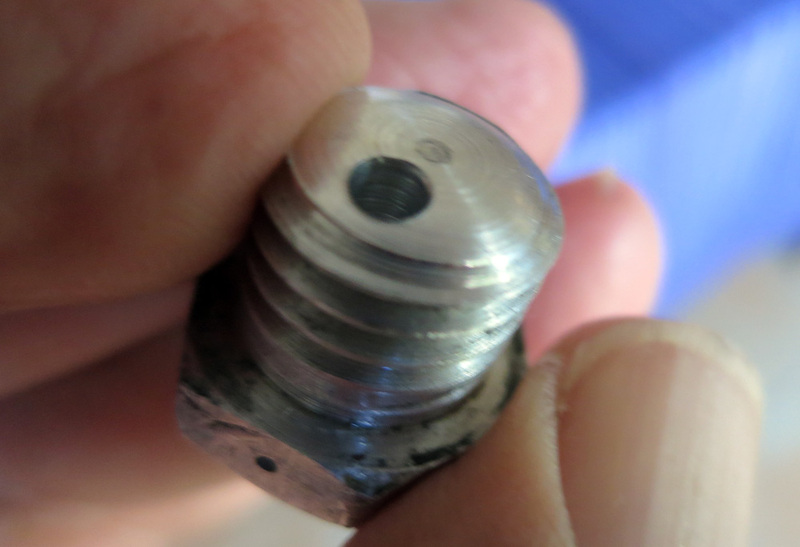 Note the tiny hole in the bolt head (at bottom). Almost invisible. It intersects with larger hole drilled in from base of the bolt. Chris had modified the plug by drilling two intersecting holes: a nearly invisible one into the side of the head and a larger hole, drilled up from the bottom. The "wee holes" combine to ventilate the gearbox. "The vent is to relieve pressure differences created inside the gearbox by temperature changes, and will reduce oil leakage to the extent it is created by pressure," Chris wrote. Look closely and you'll see light showing in the tiny hole. The two drillings intersect to vent to the gearbox. Royal Enfield guru Tim from New Zealand recommended the modification on the Yahoo forum. It requires close work with a good drill; I could never have gotten it right. Will it work? Hard to say, as my gearbox doesn't visibly leak enough for it to be noticed among the oil leaks from elsewhere on the bike! But I'm happy to have the vent, as a talking point. And — as a talking point — what ELSE could have been Royal Enfield's purpose in labeling the oil filler plug back in the day? Did it really matter so much (especially after the sale) what the owner chose to put in his gearbox? My suspicion is that the tiny writing was added to impress the fastidious potential buyer looking over a Royal Enfield at the dealership. If the company had been so particular about the gearbox lubricant as to label the plug, certainly the rest of the motorcycle must be nigh on perfect. This was an interesting story. Enjoyed reading it. Well, it could not have been that much of an advertisement, I had Kevin, the Meteor Minor for over a year before I noticed it. It is rather faint though! It is just amazing to me that there are so many people with deep knowledge about the brand. Thanks for digging them up.